A detailed Trans-Siberian Railway guide with train routes from St Petersburg and Moscow to Vladivostok, Ulaanbataar in Mongolia, and Beijing, by Dominique Mosbergen with photography by Chen Mu, and more from Smart Travel Asia and Dancing Wolf Media. The Trans-Siberian train route is one of the world’s greatest rail journeys. It is daunting too. How do you deal with red tape, babushkas, fur saleswomen, dull apparatchik, vodka, and the tundra? A guide. IF THERE is one word to sum up the Trans-Siberian Railway, together with its Mongolian and Manchurian distributary lines, it is BIG. Officially opened in 1891 by Nicholas II of Russia (who went on to become tsar), the fishplates and glinting tracks traverse seven time zones from St Petersburg on the Baltic Sea to Moscow, and on through the frozen Siberian steppes to Vladivostok on the Pacific coast. While the coal-chomping, smoke-spewing iron behemoths of yore have given way to humming electric engines and a modicum of modern comfort, not all in the mind, the carriages remain packed to bursting with the usual haul of businessmen and babushkas, soldiers and fur saleswomen, artists and apparatchik all, unwittingly, keeping alive the notion that the true romance of travel is in the journey, not just the arrival. This is big sky country, a quarter of the earth held together by a ribbon of beckoning steel. And it is one of the modern world’s greatest train adventures. As you lie languidly sprawled on your rocking bed, staring bleary eyed out of the window at the endless Siberian landscape, all calibration of time and space evaporates. For life on the world's greatest railway can often resemble a blurred suspension of reality, at once unnerving and liberating. Time stands proverbially still. There is just the here and now. Some train carriages do not have clocks and even when they do, they are either completely inaccurate or on Moscow time (which is the time all Russian trains tend to display). So as you watch that impossibly large red sun dip behind the rolling hills of the Far East, the clock will still stubbornly insist it is midday. Get used to the fact that you will be sleeping an obscene amount. It is a seductive, sweet, somnolence. Perhaps it is the near stifling blanket of summer warmth that constantly envelops you, or the shocking quantities of food and booze you end up consuming out of sheer boredom as the hours tick by, or the slow, steady rocking of the train (which never travels faster than a sedate 60kmh). Yes, despite the constant carnival of station platform commerce, sheepskins and shoes, there will be moments when your books and conversation will need to be set aside for a vacant drool. So why bother to get on? The adventure of course. The people. The food. The stories. And an endless supply of jaw-dropping anecdotes for the next family dinner. Getting on the train, unfortunately, is no picnic. A messy tangle of bureaucracy trips every aspect of the process: from getting a Russian visa to booking the right class of cabin on trains that run on seemingly random schedules. Unsurprisingly, many travellers enlist a travel agent. Organizing the journey independently though may prove to be far more affordable and even more fun. Planning a journey of this scale in a country with a bureaucracy as cumbersome and all-pervasive as Russia’s, will entail a lot of planning and, inevitably, a smidgen of stress. If you do choose to do the journey independently, arm yourself with a good guidebook like Lonely Planet’s Trans-Siberian Railway or the Bryn Thomas Trans-Siberian Handbook. Scour the Internet for gems like the comprehensive how-to Trans-Siberian Railway guide by intrepid traveller Mark Smith (www.seat61.com), also known as “the man in seat 61”. Travel agents will be helpful in arranging certain bits like arranging a Russian visa (by no means a straightforward process and one that you will want to begin at least a month before you begin your travels). Also look forward to run-ins with stony-faced, tight-lipped Russian officials manning hotel reception desks and train ticket counters. You are in their “empire” and should a clerk for no apparent reason rudely deny you entry into the hotel or refuse to take your credit card because it is “foreign”, take a deep breath and walk away. You’ll live to fight another day. You will undoubtedly find that, save for unpleasant officialdom and the occasional blustering apparatchik, Russians are generally a very kind, warm, and hospitable people who fiercely love their country and are happy that you are there to enjoy it. The first thing you will need to do is to decide on the route and your final destination. Your options are endless. Vladivostok, Ulaanbaatar, Beijing, Hong Kong, Tokyo, Seoul, Tibet, even Bangkok or Singapore are all viable overland options. The Moscow-Vladivostok route is a classic TransSiberian choice, covering a whopping 9,258km, the longest Trans-Siberian segment. However, while Vladivostok, sometimes called “Russia’s San Francisco”, with its bays and mountains, is an interesting place to visit for a day or two, it is probably not worth the seven-day journey from Moscow, unless you intend to catch the weekly ferry to Japan or South Korea. A more interesting option is to take the train to Beijing, either via Mongolia on the Trans-Mongolian line, which cuts across Mongolia, stopping at the capital Ulaanbaatar and traversing the baking Gobi desert before entering China; or via the Trans-Manchurian line. The twice-weekly train from Beijing to Hanoi will take you into the heart of Indochina. You can also ride the rails to Hong Kong. The second thing you should consider is the class of cabin. There are usually three classes to choose from: first (spalny), second (kupe) or third (platskart). Though most travellers settle for a second-class kupe, in which four people share a compartment, third-class platskartny open-plan dormitory cars are an oft-overlooked and under-appreciated option. As much as 40 percent cheaper than second-class and surprisingly comfortable (though lacking privacy), travelling third-class is an exceptional way to meet Russian people. Staring in Russia is something of a national pastime so be prepared. Stare back. Smile. Third-class, with its drunks, grandmas, and raging banter is top-class for entertainment. If you have the money, not the moxie, opt for a two-berth first-class cabin, generally double the price of a kupe tickets. This is the lap of luxury. Some spalny compartments on trains 3 and 4 on the Trans-Mongolian line come with soft beds and private washrooms. Despite the savage vagaries of winter, the Trans-Siberian Railway, a vital artery of commerce in the immense Russian railway system, runs all year round. Foreign tourists generally travel between the months of May and September, when the days are long and warm. However, the option of travelling through Russia during winter, as daunting and cold as that may sound, should not be immediately dismissed, as there is something quite ethereally beautiful about the silence and snow that envelops the Siberian landscape. The trains are also well heated so you need not worry about the subzero temperatures outside. Chances are you will be wandering beyond the walls of your toasty train wagon so keep in mind that travelling through Russia in the dead of winter is not for the faint-hearted — or the unprepared. Never underestimate how cold it can get. Near Chita, in southeast Siberia, temperatures fall below sixty degrees Celsius in the heart of winter. Even in St Petersburg, it can dip to below forty in February. This is moose-freezing stuff. Keep your pinkies covered. The next thing you should consider is whether you want to make the entire trip in one go or if you want to stop off on the way. What many people don’t know is that Trans-Siberian trains are ‘reservation obligatory’, which means that every time you step on board a train, you must have a confirmed reservation for that specific journey on that specific train on that specific date. In other words, you cannot simplyhop on and off trains spontaneously without a reservation. If you want to travel from Moscow to Vladivostok but you want to stop off at Irkutsk along the way, you need to have two tickets: a Moscow-Irkutsk ticket and a separate Irkutsk-Vladivostok ticket. Arrange all your tickets in advance. Many people travel all the way from Moscow to Vladivostok or Beijing all in one go on one of the three direct eastbound trains. Every other day, the “Rossiya” (train 2 eastbound) leaves Moscow on its weeklong journey to Vladivostok. One-way fares in the summer months cost around US$600 in second class, if you buy directly from a Russian Railways ticket booth, or around US$900 if you book through an agent. Once weekly, on Tuesdays, the Trans-Mongolian train (train 4 eastbound) leaves Moscow on its six-day 7,621km ramble to Beijing. Booked through an agency, a ticket in second class will cost you around US$800. On Fridays, the weekly Trans-Manchurian train (the “Vostok” or train 20 eastbound) leaves Moscow for Beijing via Manchuria, taking just over six days to cover 8,986km. A second-class ticket will set you back around US$800 when bought from a travel agent. While it is possible — and relatively easy — to buy tickets for the domestic “Rossiya”train directly from Russian Railways, it is nearly impossible, especially during the summer months, to buy tickets independently for trains 4 and 20. Find an agent to help you. While these long-haul direct train rides are certainly doable and enjoyable, it is highly recommended that you stop along the way and break journey. For while the Trans-Siberian Rail journey is indeed a trip unto itself, there are some wonderful cities and sights that you simply should not miss. Of course, all Trans-Siberian trains stop at stations every few hours, for between five and 40 minutes (and at the international borders for up to six hours), which will give you enough time to get off the train, stretch your legs, take photographs and buy anything from a whole roasted chicken ($2) to a jarful of pickles ($3) or a pair of handmade knitted gloves ($8) from the adorable babushkas who hock their wares on station platforms. However, these brief stops, though — quite literally — a welcome breath of fresh air, do not afford enough time for a tour of the town. It would be a good idea to stock up on food and water before you get on the train — or during one of these brief stops. There is a handy and staggeringly accurate schedule at the front of each wagon, which lists every stop and its duration. Buy some dry food for yourself, such as bread and pot noodles (which you can cook using the hot water provided very conveniently in every train wagon), fruit (not always easy to find on the road in Russia), enough water to last you the duration of the journey, as well as some snacks which you can share with your fellow passengers. Though you should and will probably bring food that will keep and not stink up the train, don’t be surprised if you see your bunkmates, clad in comfy and often bizarre-looking pyjamas, feasting on whole roast chickens and hunks of whiffy dried fish. Russians have a knack for making themselves at home. There is no room for stuffy propriety. Mimic their insouciance. Swap your shoes for a pair of well-worn tapechki (house slippers), kick back, and relax. If you run out of supplies, do not panic. You are not about to starve. Not only do conductors always have a small stash of goodies (including chocolate bars, chips, pot noodles, tea and bottles of water) available for sale for only a fraction more than their retail price, all the main Trans-Siberian trains have a restaurant car. Wonderfully spacious and comfortable, with cosy booths and unobstructed views — and, if you’re lucky, air-conditioning, the dining carriage is a great way to escape the heat and the multitudes. Russian restaurant car food is also quite tasty and not terribly expensive (a two-course meal with a bottle of beer will probably set you back around US$20). The menu is, of course, neither extensive nor impressive, but there will always be a small selection of yummy traditional soups and salads to choose from, as well as some ham, schnitzel, potato or macaroni dish. The restaurant also sells beer and of course vodka. You can also get a pretty decent cup of coffee or tea and choose from a reasonably good selection of snacks that range from salted peanuts to fancy chocolate. As for how much time you will need for the journey, it is entirely up to you. But remember that foreigners can only stay in Russia for 30 days on a regular tourist visa. You will most likely spend two to three weeks at best on a stretched trip. Some tips for the journey. If there is one thing you should always have with you, it is toilet paper. This is not a joke. The toilets on the train are surprisingly clean (for most of the journey, it gets dirtier as the days go on) but there are times when the toilet paper runs out and this is an inconvenience that you will want to avoid. Also, on the road, especially in smaller cities and towns, the toilets can be, to put it mildly, appalling. Bring a mini Russian-English dictionary or phrasebook. While you do not need to learn Russian to do this journey, it would help to know the Cyrillic alphabet and a few phrases. Safety is not a major issue but pickpockets are becoming a real nuisance in many cities along the Trans-Siberian Railway route. Though rarely violent, they are skilful and oppressively ubiquitous. A money-belt would be useful. Keep your documents (passport, visa and registration if you need one) and money close to you at all times. If you are in any Russian city for longer than three days, you will need to register yourself there. Most hostels and hotels will do this for you for free if you are staying with them or for a nominal fee if you are not. Russian policemen are notorious for stopping foreigners on the street to ask for documentation. Yes, they can do this and yes, you are required to have all these documents on you at all times. And yes, you can get into a serious pickle if you don’t have the stuff. Even if it is the heart of summer, bring a wind-proof jacket with you. Siberia is Siberia and even in July, it can be cold. Don’t forget your camera, eyeshades and earplugs. Carry a small towel and bar of soap with you for quick, sink-based showers. Make sure you have some comfortable train clothing that is light and that does not stain easily. Bring your own cutlery. You can’t get any on the train. Having said all that, pack light. There is not much room for luggage in the train compartments. The Chinese sage Lao Tzu once said, “A good traveller has no fixed plans and is not intent on arriving”. But on a journey like this, the travel is only half the fun. With three distinct Trans-Siberian routes spanning a quarter of the globe, it would be difficult to describe in detail every journey and destination. The Trans-Mongolian rail route is undoubtedly the most diverse of the three, cutting across three distinct cultures, landscapes and languages. That’s what we picked, to journey from St Petersburg to Ulaanbaatar. Morose and beautiful, elegant and aloof, St Petersburg is arguably Russia’s most stunning cultural repository. With its rich artistic heritage, the place that Vladimir Nabokov described as the “world’s most gaunt and enigmatic city”, is a wonderful introduction to Russia. Enter overland from one of the Baltic States or fly into St Petersburg’s Pulkovo Airport. You will be spellbound by the city that Peter the Great mulishly built on an uninhabited swamp in 1703. Today, with its handsome 18th-century European buildings, quaint Parisian cafes and its quintessentially Russian soul, it is a fascinating blend of unpredictable weather and magnificent sights. Stroll along Russia’s most famous street and Petersburg’s main thoroughfare, Nevsky Prospekt, reminiscent of New York’s Madison Avenue. Visit the magnificent Hermitage museum (entrance fee US$11), housed mainly in the pistachio-green winter palace. The Russian Museum (entry $11) is another must-see that houses one of the country’s finest collections of Russian art. Enjoy an opera or ballet performance at the dazzling Mariinsky Theatre. Visit the final resting places of Dostoevsky, Tchaikovsky, Sergei Witte and other luminaries at Alexander Nevsky Lavra, and admire the equestrian statue of Peter the Great, the Bronze Horseman. The next stop is Moscow, the starting (or the ending) point for your train journey across Mother Russia. To get to Moscow by train, you will be leaving from St Petersburg’s Moskovsky vokzal. There are several St Petersburg-Moscow trains daily, though most people prefer to take one of several convenient overnight trains. Despite the constant claim that Moscow is a very Russian city, it is fast becoming an international melting pot. You will be pleasantly surprised to hear Bollywood music blaring from roadside fruit stands and to see multi-racial couples kissing furiously on the streets. A visit to Moscow would not be complete without a visit to the Red Square. Gawp at the whimsical candy-stripe domes of St Basil’s Cathedral and visit the swank department store GUM (pronounced “goom”). The State History Museum (entrance fee US$7) has an enormous collection covering the gamut from the Stone Age on while Lenin’s Mausoleum displays the preserved body of the leader of the October Revolution. At the apex of Russian political power and once the centre of the Eastern Orthodox Church, the Kremlin (entry $9) is not only the heart of Moscow, but of the whole country. For something more cheerful, check out the festive Gorky Park, at once both ornamental garden and funfair, complete with old-fashioned carousel, or head to the atmospheric Nikulin Circus. To see Russians unleash their carefree side, head to the trendy and lively Arbat District, well-known as a sort of art market, where instant-portrait painters, soapbox poets and buskers gather to entertain all comers. Also sample the massive Moscow Metro system. With 300km of rail and an average six-and-a-half million people using it daily, the Moscow Metro is the world’s second most heavily used rapid transit system (trailing only Tokyo’s). Once you get accustomed to the rather daunting metro map, you will find that it is the cheapest ($0.80 one-way) and most efficient way to get around the city. With its ornate Soviet-era stations, travelling on the metro is also an interesting sightseeing experience. 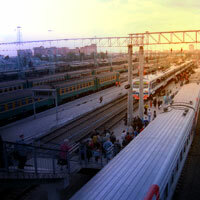 Moscow has nine main train stations, so when departing, be sure to leave from the right one. Chances are, if you are heading towards the Urals and Siberia, you will be leaving from the imperious Yaroslavl vokzal, a 1902 stylized reproduction of a traditional Russian fort, or Kazansky vokzal. 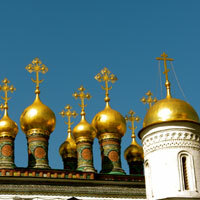 Just 191km from Moscow is the historic city of Vladimir, capital of the early Russian nation of Rus in the 12th century. With exquisite examples of Russia’s mediaeval architecture, some entertaining museums and the majestic Assumption Cathedral, Vladimir is one of Russia’s most interesting old cities. From Vladimir, the train will follow the valleys of the Klyazma and Oka Rivers, passing several ancient towns, including Kovrov (now known for the curious and hazardous sport of motoball, or football on motorcycles), and the very pretty ski resort town of Gorokhovets. Next, the train passes Nizhny Novgorod, Russia’s fourth largest city, which sits on the southern bank of Europe’s largest river, the Volga. Nizhny, with its grand 16th century kremlin and profusion of pretty churches and monasteries, some dating back to the 13th and 14th centuries, is worth a visit if you can spare the time. Fans of Maxim Gorky, who was born in Nizhny, should make a stop at the Gorky Museum, located in the wooden house where the writer once lived. Nestled between the Kazanka and Volga rivers, multicultural Kazan, the capital of Russia's autonomous Republic of Tatarstan, has a population of little over a million, comprising both Tatars (Turkic Muslims) and ethnic Russians. At once quaint and modern, with an easily-navigable city centre and friendly locals, Kazan is worth a gander. The striking kremlin, with its stark white limestone walls and towering turrets, is the focal point of the city's historic centre. Declared a Unesco World Heritage site in 2000, the Kazan kremlin is home to a number of religious buildings, including the enormous Kul Sharif Mosque and Anunciation Cathedral. Perm is a heavily industrialised, booming city, full of zest and activity. Perm boasts one of Russia’s pre-eminent ballet schools, some of the best scientific and medical institutes in the country and a fair bit to do. The city has a few interesting museums on offer, including the Architectural-Ethnographic Museum, 45km outside Perm in the lovely wooden-house village of Khokhlovka, and the Sergei Diaghilev Museum (admission by donation), which pays tribute to the renowned ballet company Ballets Russes. If the weather permits, you can go horse riding or river rafting (try tour company Krasnov, www.uraltourism.ru). And if you happen to be there in late July or early August, you can take part in the annual Kamwa Festival, which sees a coming together of ancient ethno-Ugric traditions with modern art, music and fashion. The train rumbles on to Yekaterinbug, the first major station in Asian Russia and the cultural and economic capital of the Urals. Yekaterinburg, once a Bolshevik stronghold, is perhaps most famous for being the city in which the last tsar of Russia, Nicholas II, his wife and children were executed in July 1918. The spot where the Romanovs met their end is dominated by the huge Byzantine-style Church of the Blood. Yekaterinburg also boasts a plethora of museums, including the Museum of Architecture and Technology, the Ural Geology Museum, and the Urals Mineralogical Museum, a treasure trove of semiprecious stones and crystals. Yekaterinburg is also a good staging point for adventurous forays into the Urals. Ural Expedition & Tours (welcome-ural.ru), led by a group of geologists from the Sverdlovsk Mining Institute, can help you plan and set up trekking, rafting and horseback-riding trips to all parts of the Urals, including Taganay and Zyuratkul National Parks. Travelling a little farther east, crossing mile after mile of semi-taiga and uninspiring farmlands, you will arrive in the lively and pleasant oil-rich city of Tyumen, the region’s oldest Russian settlement, where you can tour a number of picturesque monasteries and churches, eclectic museums and pretty parks. Some distance away is the very Siberian city of Omsk. About 2,700km from Moscow, Omsk is notable for two things: its abundance of Lenin statues (at least five, including one outside the main train station) and its grim history as a major dumping ground for exiles in the 1800s (Dostoevsky, who was imprisoned in Omsk for six years, immortalised the city in his book Buried Alive). From Omsk, you will head towards the sprawling but dour Novosibirsk. As you approach Russia’s third largest city, hold your breath — for you will be travelling across the seven-span, 870m-long bridge across the Ob River, one of the world’s longest. Here, the Ob is half a mile wide, even though it is thousands of kilometres away from its mouth on the Arctic Ocean. Boasting the largest train station along the Trans-Siberian Railway, a railway museum and a locomotive collection in nearby Seyatel, Novosibirsk is a must-see stop for all train enthusiasts. The brand new West Siberian Railway Museum (admission free), located close to the mammoth main train station, has a small but fascinating collection of train parts, photographs and other historical artefacts. 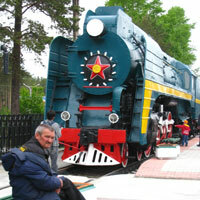 The Seyatel Railway Locomotive Museum, located about a half hour from the main train station, is a must-see. The museum has over 100 brightly-coloured exhibits, ranging from Soviet steam engines to pre-revolution carriages, all of which you can clamber upon with reckless abandon. 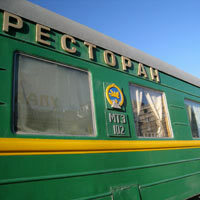 To get there, take the 1015 marshrutka (shared taxi) from the main train station to Seyatel train station (about $1.50). In truth, the city of Novosibirsk would probably not exist if it weren’t for the commerce and life-infusing Trans-Siberian Railway. Founded in 1893, the city grew around the Ob River bridge then being built as part of the railway project. Today, Novosibirsk is Siberia’s largest metropolis and Russia’s third largest city. Locomotives apart, the place is largely uninspiring and dull. Novosibirsk is almost always cold. A man on the train who had lived in Novosibirsk for all his 55 years told me dryly that the wind never stops blowing in this city. “Is there anything to do?” I enquired. He shrugged his shoulders and suggested I head back to Moscow. It is hard to disagree. Hewn from ice and cold this is a forbidding city with limited and expensive accommodation and poor restaurants. You may want to check out the Local Studies Museum, which has some marvellous religious artefacts or the State Art Museum with its extensive collection of icons and Siberian art. You should also hang out on Ploshad Lenina, dominated by the huge, silver-domed Opera & Ballet Theatre, in front of which stands a rather debonair statue of Lenin, wearing a billowing coat and flanked by waving devotees. Rather than dawdle in Novosibirsk, you may want to consider taking a shared taxi (about US$20 for a four-hour drive) or bus ($10, six hours) to Tomsk, one of Siberia’s hidden gems. A vibrant — and very likeable — university city, Tomsk is home to some of Siberia’s finest traditional wooden-lace architecture and a handful of memorable museums, including the Oppression Museum, housed in the spooky dungeon of the feared NKVD (later the KGB). From Tomsk, you can take a train directly to Irkutsk, via Krasnoyarsk, or you could return to Novosibirsk, from where you can not only head to Eastern Siberia and beyond, but also to Astana and Almaty in Kazakhstan, via the Altai region. If you are leaving from Novosibirsk, take a look at the second world war memorial statues on platform one, depicting a family waving off soldiers to the front. Though the Nazis never made it this far into frozen east, many Russians left for the war from this very station. Even today, you will see hordes of young, freshly shaven Russian soldiers waiting for trains that will trundle them to some forgotten Siberian outpost. A little more than half a day away from Novosibirsk, across the lush forests of Krasnoyarsky Kray, sits the youthful and vivacious city of Krasnoyarsk. Nestled amidst forested foothills, Krasnoyarsk offers a range of enjoyable activities for the weary traveller, including river trips, museums like the superb but dully-named Regional Museum, live performances at the swinging Rock-Jazz Kafe and walks in the picturesque 17,000-hectare Stolby Nature Reserve, an area littered with the spiky volcanic rock pillars called stolby that Krasnoyarsk is famous for. If you only want to get off once between Moscow and your final destination, make that stop in Irkutsk, the next important city on this journey. I have to say that is arguably impossible to be disappointed in this place, and with good reason. 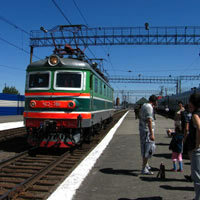 Irkutsk is by far the most popular stop for trans-Siberian travellers. Admittedly, Irkutsk itself is not an exceptionally appealing town (though with its fancifully rebuilt churches, striking 19th century architecture and genuinely friendly and diverse set of locals, it is by no means an unattractive one). However, Irkutsk’s biggest draw is its close proximity (about 70km) to the breathtakingly beautiful and mind-bogglingly vast Lake Baikal, the world’s most voluminous – and deepest – freshwater lake. Spend a day in Irkutsk, paying a visit to the endearing Bogoyavlensky Cathedral and the pretty Znamensky Monastery, as well as the old Art Gallery, which has a fairly sizeable collection of art ranging from Mongolian Buddhist religious paintings to Russian Impressionist works, and the decent Regional Museum, housed in a rather swish brick building. But as soon as you can manage it, hop on a bus at the small and decrepit central bus station and head towards the lakeside towns of Listvyanka or Khuzhir on Olkhon Island. Alternatively, you can take an elektrichki (an electric train) to Slyudyanka. While it would only take you an hour-and-a-half to get to Listvyanka and two-and-a-half hours to get to Slyudyanka, compared to the six-hour journey to Khuzhir, definitely go to Olkhon Island if you can. 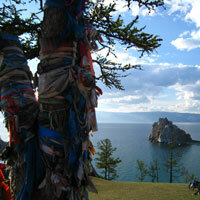 Halfway up Lake Baikal’s western shore and reached by a short ferry ride, this exquisite island is a wonder to behold. With steep mountains, taiga, steppe, a small desert on its 730sq km expanse, and even frolicking herds of wild horses, Olkhon has plenty to offer the wide-eyed adventurer. Equally spectacular are the crystal clear, blue waters of Lake Baikal. Considered one of five global poles of shamanic energy by the indigenous Buryat people, the island’s main settlement is Khuzhir. If there is room, stay at Nikita’s Guesthouse, run by a former Russian table tennis champion and his wife. It is a welcoming and eco-friendly traveller hangout. From Irkutsk, your final destination in Russia before heading into Mongolian territory is the charming city of Ulan Ude, the capital of the Buryat Republic. With a sizeable Buryat population, this city is as Asian as it is Russian. Numbering over 400,000, the Russia-domiciled Buryats, a Mongol race, have now largely converted to Tibetan Buddhism. 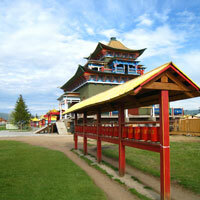 The Ivolginsky Datsan, founded in 1946, is a monastery complex about 40km from Ulan-Ude. Try to arrive before the 9am khural (prayer service) which believers and non-believers alike can partake in. 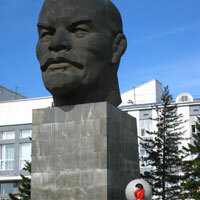 Ulan Ude is also famous for the world’s largest Lenin head — a laughable idea perhaps, though in reality, quite a remarkable sight. This vaguely cross-eyed colossus sits prominently in the Stalinist main square, Ploshad Sovetov. Waving goodbye to Lenin’s big head may just be the perfect way to bid farewell to this vast country you’ve just travelled across, as you hop on the train again, this time headed south into the rugged endless horizons of Mongolia. Entering Mongolia brings a change of scenery as the forests thin out into the green pastures of the fertile Selenga Gol river basin. As you near the capital, rolling hills, covered with swaying wildflowers and grazing animals, and dotted with traditional Mongolian gers (felt tents), flash by the window. As you start approaching Ulaanbaatar, however, all romantic visions of pastoral pulchritude will evaporate speedily as the sprawling, ugly city reveals itself. Ulaanbaatar is a bit of an eyesore. With its dreary Soviet-era buildings, it is a little too reminiscent of Novosibirsk. Still, beneath this façade lies a dynamic city that pulses with a passion and genuine warmth that will thoroughly delight visitors. Gandan Khiid, home to the spiritual head of Mongolia, the Khamba Lama, is Ulaanbaatar’s largest and most important monastery. Built in 1838, the monastery was home to the 13th Dalai Lama for a few years after he fled Lhasa in 1904. It thankfully survived the communist purges of the 1930s and today is a vital and vibrant religious complex where over 800 monks reside and hundreds of worshippers come daily. The 26.5m gilded statue of Buddha stands in the main building of Migjid Janraisig Sum and is quite a sight. You may also want to visit the Winter Palace of the Bogd Khaan, once home to Mongolia’s eighth living Buddha and last king, and the Monastery-Museum of Choijin Lama, where you can see dinosaur fossils and skeletons dug up from the Gobi desert. If you happen to be in the city in mid-July, make it a point to partake in the Naadamfestival, a high point of the Mongolian calendar. Part family reunion, part fair and part nomad Olympics, Naadamis an outlandish, insanely entertaining affair, complete with wrestling tournaments, elaborate parades and kitschy carnivals. Ulaanbaatar also has great nightlife and an excellent selection of restaurants, bars and pubs that serve up traditional Mongolian food, Russian fare and cuisine from all over the world. While Ulaanbaatar is definitely a fun place to be in warts and all, Mongolia’s real allure lies in the pristine, rustic beauty of its unspoiled countryside and its rich nomadic culture. 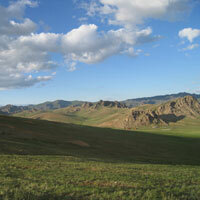 To really explore Mongolia, you will need several more weeks and other modes of transportation. Try the overnight trip to Terelj, about 80km northeast of Ulaanbaatar and part of the tranquil Gorkhi-Terelj National Park. With spectacular alpine scenery and many opportunities for hiking, rock climbing, rafting and horseback riding, Terelj is a wonderful escape from the hustle and bustle of Ulaanbaatar. Once in Terelj, you can stay at one of many ger camps in the area. En route to Terelj, you could make a stop at Tsonjin Boldog, the legendary spot where Genghis Khan found his golden whip. 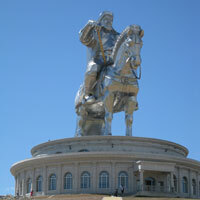 Gawp at the gargantuan 40m silver metal statue of the Mongolian national hero astride his horse. As a perfect end to an astonishing journey, take an elevator to the top of this equestrian statue, said to be the largest in the world, and stare the rather bemused-looking Genghis (also Chinggis, and a great explorer himself), in the face. And here our Trans-Siberian Railway guide finally runs out of rail. Tired, dusty and dishevelled, smelling perhaps of dried fish, vodka, and cigarettes, you have traversed a quarter of the globe and lived one of life’s greatest adventures. And, assuming you packed sensibly, you have the world’s greatest railway journey safely captured on 12 megapixels or more. At that next family sit-down, don’t let others bore you. Grab your notebook and start talking. Or build a giant statue for yourself.